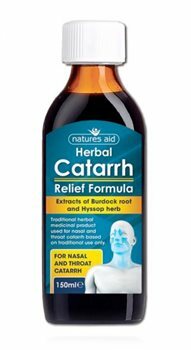 Herbal Catarrh Relief Formula - Extracts of Burdock root and Hyssop herb. For Nasal and Throat Catarrh. Traditional herbal medicinal product used for nasal and throat catarrh based on traditional use only. Take one 5ml spoonful 3 times per day. Do not take more than advised. Not recommended for under 18 years old. Do not take if you are: allergic to any of the ingredients or to plants of the Asteraceae (compositae) family: pregnant or breastfeeding: taking medicines known to interact with alcohol.